This Irish hockey jersey features the Guinness harp trademark on the chest and 1759 on each sleeve! 1759 is repeated on the back along with Ireland and Guinness. The Guinness hockey jersey is embroidered on the front along with the back and both sleeves along and it is enhanced with the famous Arthur Guinness signature which is embroidered on the left sleeve. 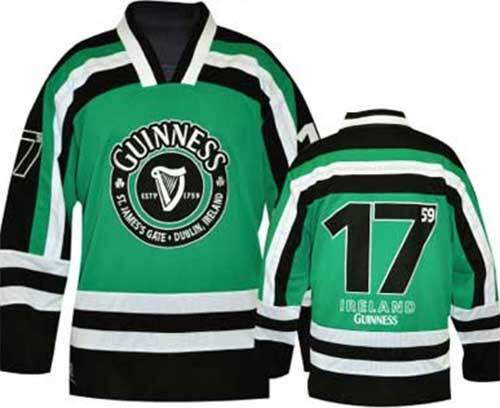 The Guinness hockey jersey features the harp logo and a black and green design with white accenting. The Guinness hockey jersey is a traditional design that is made of 100% high-performance polyester and mesh material that is comfortable and cool to wear. The Guinness hockey shirt is available at The Irish Gift House in limited sizes.